The anti-abortion group behind two undercover videos of Planned Parenthood executives discussing fetal tissue donation visited one of the organization’s clinics in Houston, Planned Parenthood officials said. Editor's note: This story has been updated with response from the Texas attorney general's office. 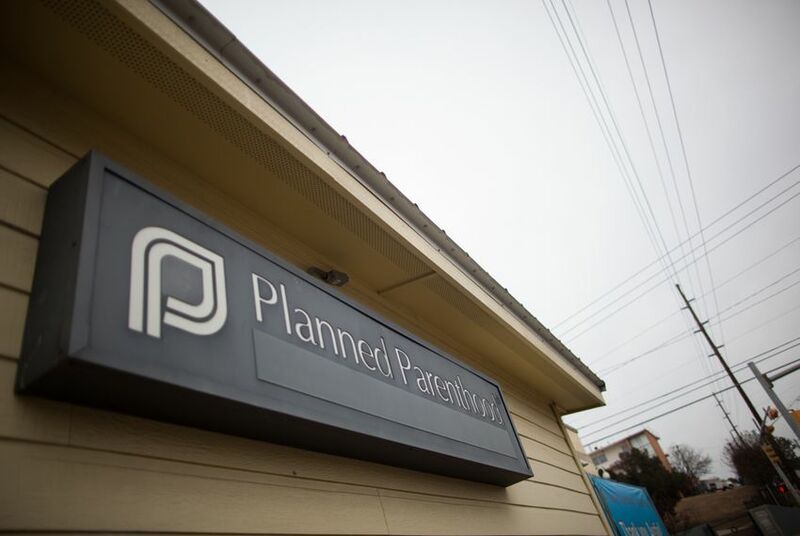 The anti-abortion group behind two undercover videos of Planned Parenthood executives discussing fetal tissue donation visited one of the organization’s clinics in Houston, Planned Parenthood officials said Sunday. Two people “fraudulently representing themselves” as research executives and providing fake California driver's licenses toured the Planned Parenthood facility in April “under the guise of discussing tissue research with our clinic research staff,” said Planned Parenthood Gulf Coast spokeswoman Rochelle Tafolla. “We suspect that they were secretly taping those conversations and those interactions in our building will be included in another of their highly edited and deceptive videos,” Tafolla said of the Center for Medical Progress. That anti-abortion group previously released two videos depicting Planned Parenthood executives in California talking about how their providers obtain fetal tissue for medical research, prompting calls for investigations from Texas’ Republican leadership. A request for comment to the Center for Medical Progress was not immediately returned Sunday, but the group has said that the videos are part of a series that resulted from a three-year investigation. Tafolla said the two people who visited the Houston facility — including a center where abortions are performed — identified themselves as executives with Biomax Procurement Services, a shell company created by the Center for Medical Progress. The two hidden-camera videos about Planned Parenthood feature actors posing as buyers for Biomax. Those videos allege that Planned Parenthood is illegally profiting from the sale of tissue of aborted fetuses — an accusation the organization has vehemently denied. Planned Parenthood officials say the videos are misleading because the organization does not profit from tissue donations and only receives reimbursements for costs incurred by clinics that participate in tissue donations. The full first video — first released in a shorter, edited form on July 14 — includes an almost three-hour lunch meeting with Dr. Deborah Nucatola, Planned Parenthood senior director of medical services, during which the doctor discusses in detail how fetal tissue is preserved and donated and which organs researchers often request. But Nucatola also emphasizes that Planned Parenthood affiliates “are not looking to make money by doing this." While condemning the undercover videos, Planned Parenthood Federation of America President Cecile Richards also apologized for Nucatola's "tone and sentiment" in the videos. The second video includes a discussion about compensation for “intact tissue” with Dr. Mary Gatter, another Planned Parenthood executive, who asks the individuals posing as fetal tissue buyers for an offer. “Well why don’t you start by telling me what you’re used to paying?” Gatter says, adding later that the organization only seeks reimbursement for the costs associated with donating fetal tissue. Planned Parenthood facilities that participate in fetal tissue donation can donate the tissue for research if a patient consents, according to the organization. Federal law allows clinics to be reimbursed for costs “associated with the transportation, implantation, processing preservation, quality control, or storage of human fetal tissue” for research purposes. Planned Parenthood health centers in Texas do not currently donate tissue for medical research, according to the organization. Planned Parenthood Gulf Coast in Houston has participated in fetal tissue donation, partnering with the University of Texas Medical Branch at Galveston in 2010 for a study on causes of miscarriages. The Houston facility has also conducted clinical trials in the area as part of research on contraception, HIV testing and the human papillomavirus vaccine. Soon after the first undercover video was released, state leaders ordered investigations into Planned Parenthood. That investigation has included visits to the Houston clinic by representatives of the Department of State Health Services and the attorney general’s office, Planned Parenthood officials said Sunday. The investigators requested information about the clinic's practices regarding fetal tissue donations, Tafolla said. A spokesman for the Health and Human Services Commission, which oversees the state health department, declined to comment on the investigation. A spokeswoman for the attorney general's office on Monday also declined to comment on the probe but confirmed that investigators had visited the Planned Parenthood clinic in Houston. Texas Republicans have long targeted Planned Parenthood facilities in the state, working to restrict the organization’s ability to provide abortions in the state and cut off taxpayer dollars sent to the organization for other women’s health services. The Senate Health and Human Services Committee is set to meet Wednesday as part of a probe into Planned Parenthood’s “business practices” related to fetal tissue. Ahead of that hearing, an attorney for Planned Parenthood sent a letter to Republican state Sen. Charles Schwertner of Georgetown, alleging that the committee chairman has access to an eight-hour video recorded by the Center for Medical Progress that committee members will view ahead of the hearing. A request for comment to Schwertner’s office was not returned Sunday. Disclosure: Planned Parenthood was a corporate sponsor of The Texas Tribune in 2011. The University of Texas Medical Branch at Galveston was a corporate sponsor of the Tribune in 2012. A complete list of Tribune donors and sponsors can be viewed here.